A peculiar square formation recently discovered within the Neolithic stone circle monument of Avebury henge is reshaping the traditional narrative of one of the wonders of the prehistoric world. It seems one of the world’s largest Neolithic circles had its ancient beginning as a simple wooden house. Experts consider that the hidden stones , recently discovered with the help of radar technology , were one of the earliest structures at the site and could have possibly honored a Neolithic building structure to around 3700 BC. When the find was first made in 2017, the Guardian reported , that previously archaeologists suggested that the huge stone outer circle – which at 330 meters (1080 ft) in diameter is the largest in Europe – had been constructed from the outside inwards. The most recent work, however, shows that a lowly wooden building that possibly served as a center of interest for the Neolithic community, seeded the monument with a successive series of stone structures springing up around it over hundreds of years. Although the exact chronology is still unknown, the team suggests it was built around 3700 BC, due to the type of flint tools that have been found at the site. From then, and over the course of centuries, the site grew larger and lager until the massive monument that survives today. Gillings and his team spotted the positions of the prehistoric standing stones, which they speculate were hidden and buried for many years, while they suggest there are more stones at the site which most likely were destroyed during the 17th and 18th centuries. Usually, henge monuments like Stonehenge are round, making Avebury extremely rare, a fact that gives new meaning to the recently discovered formation. First evidence to the existence of a square structure, each side of which was around 30 meters (100ft) in length, were first discovered by the archaeologist Alexander Keiller who carried out an excavation at the site in 1939. Keiler would discover a few small stones positioned in a line close to a 6 meter (20 ft) upright stone known as the Obelisk. Keiller’s excavation would also divulge postholes and grooves in the ground, indicating that a building was once standing there, “He concluded that it was a strange medieval lean-to cattle shed,” Gillings told the Guardian. Nevertheless, when the newly found square was compared with Keiller’s notes, archaeologists discovered that the stones were centered on and lined up with the building, indicating that it was Neolithic in origin. Similar Neolithic buildings have recently been discovered at other sites and experts suggest that they probably served as a center of interest for communities. “It completely changes the narrative. The seed might have been in the form of a small inconspicuous house. The commemoration gradually got more dramatic and in your face and by 2,000 BC you’ve got stones everywhere,” Gillings told the Guardian. So the question now is: Will the new finds become the reason for organized arachaeological excavations launch at the site? Gillings leaves no doubt with his answer: “Hell yeah. If this doesn’t I don’t know what would. We’d like to go in and excavate and tease out more of the details.” And the truth is, that is the only way to get more evidence regarding the deep rigns of this enigmatic and massive monument. 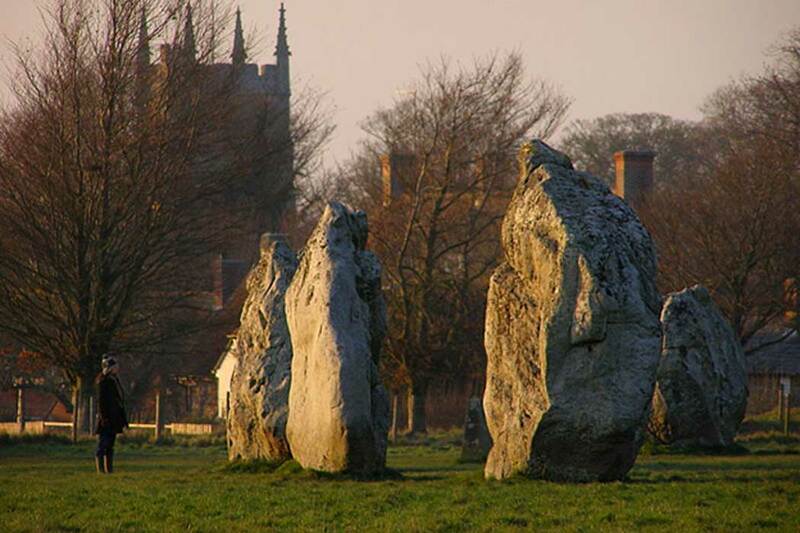 please remove my air photo of Avebury from this page. It has been used without permission and my copyright notice has been stripped off. The stones in the newly discovered house were the holy objects. The house could have been built to protect the stones, or to provide housing for the priest(ess) that cared for the holy objects. Most people do not build homes with large rocks in the middle of the room for no reason unless there is something very special about the stones. As religious rites became more important to the community the desire for a more impressive token of worship; a church, if you will, grew and the next outer circle of stones was created. It is possible that human ego entered the equation and the priest(ess) convinced the community to build an even larger circle of stones, thus adding to the priest(ess)'s importance or currying the favor of the god(s) the stones represented. The small house may not be dedicated an individual person but to the god(s) the holy stones inside the house represent.